Out of convenience, or to pursue a political agenda, the British colonisation of Australia is often termed a "white settlement" or a "white invasion." Such terms are inaccurate considering that Convicts of African extraction walked among those of British extraction (and Convicts of Greek, Italian, French and Indian extraction). Although their numbers were small, they had a level of influence that vastly exceeded their small numerical status, and so ensured that the colonial experience had a definitive shade of colour. These black Convicts included Billy Blue; the operator of a ferry service between Nth Sydney and Circular Quay. Aside from providing a valued service to the colony, Billy's eccentric nature helped him attain the status of what could be defined as Australia’s first celebrity. 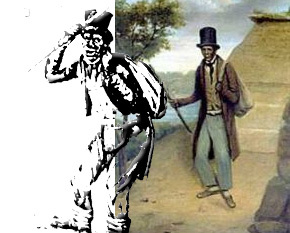 Another black included John Casare who, as Australia's first bushranger, forged a pathway that later made icons out of Ned Kelly and Ben Hall. Born in the West Indies, John Caesar fled to England to escape plantation slavery. Ironically, he soon found himself transported to Australia on the first fleet where he once more faced a life of slavery. On 29 April 1789, Caesar were tried for theft. A fortnight later Caesar, described as "an incorrigibly stubborn black," bolted with some provisions, an iron pot, and a soldier's musket. Garden robberies became frequent. "Caesar stole a musket ... from Abraham Hand, a marine, and took to the bush. However, any intention he had of living off the land was soon abandoned because of the scarcity of game. Instead, he began prowling around the outskirts of the settlement with a loaded musket, stealing what food he could find. On May 26 he narrowly escaped capture after he had helped himself to the rations of a gang who were making bricks at Brickfield Hill, and on the night of June 6 he was caught by a convict named Wm. Saltmarsh while attempting to steal some food from the house of the colony's assistant commissary for stores, Zachariah Clark." Caesar's capture presented Governor Phillip with something of a dilemma. The Governor had to protect the colony's scarce food supply; but he saw value in Caesar's as a labourer. In December 1789, Caesar escaped for a second time. On 6 March the Sirius and Supply sailed for Norfolk Island, taking with them nearly a third of the population - including Caesar. Caesar returned to Sydney in 1793, and still incorrigible, took up his former practice of subsisting in the woods by plundering the farms and huts at the outskirts of the towns. He was soon taken; severely flogged but merely declared with exultation and contempt, that "all that would not make him better." Caesar was not the only troublemaker maker in the colony. Of even more concern was the Pemulwy, an aborigine who was leading a guerrilla warfare of resistance. Caesar seriously wounded Pemulwy, and was proclaimed a hero throughout the colony. In 1795, Caesar escaped once more and formed a gang of fellow runaways. Hunter proclaimed a reward of five gallons of rum on 29th January 1796. "The many robberies which have lately been committed render it necessary that some steps should be taken to put a stop to a practice so destructive of the happiness and comfort of the industrious. And as it is well known that a fellow known as Black Caesar has absented himself for some time past from his work, and has carried with him a musquet, notice is hereby given that whoever shall secure this man Black Caesar and bring him in with his arms shall receive as a reward five gallons of spirits." COBLEY, J. Sydney Cove, 1788-1795. 4 vols. (Vol.1: 1788;Vol.2: 1789-1790; Vol. 3: 1791-1792; Vol.4: 1793-1795 The Spreadof Settlement.). (Lond. 1980-1983).